The first time I heard about a "virtual simcha" was in the late 1990s. Detroit was hit with a massive snowstorm and the 8-day old baby boy's aunt who was to play the role of rabbi was stuck at the airport in New York. The rabbi improvised and she officiated at her nephew's bris via speaker phone. Of course, if this happened in 2010 and not in the late 1990s the bris would have been officiated by the rabbi through Skype, and she would have seen the simcha and been seen by the attendees. Using technology to add people to a simcha is becoming more common. An increasing number of grandparents and great-grandparents are attending their grandchildren's wedding in the virtual world. 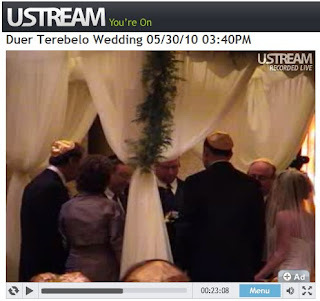 Just last month I officiated at a wedding that was being streamed live to Israel so that the bride's elderly grandparents could "be there." 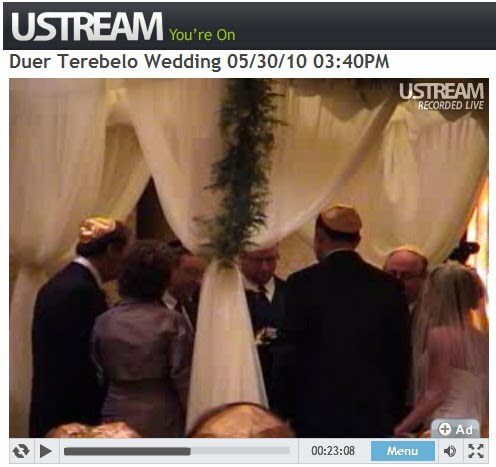 Through Ustream.tv, the grandparents felt like they were at the wedding even if it meant staying up late into the night in Israel. Elicia Brown, writes in the Jewish Week about several of these simchas that would have otherwise been missed by family or friends, like the grandparents in Australia beaming themselves into their grandson's Brooklyn bris. Or Conservative rabbis Erez Sherman and Nicole Guzik who married each other in January with the virtual presence of Rabbi Sherman’s brother Eyal Sherman, a paraplegic, and his sister Rabbi Nogah Marshall, who was nine months pregnant at the time. A $40 webcam was clipped to the ark; a laptop was discreetly placed on the bima of Temple Sinai, allowing Rabbi Sherman’s siblings to view the proceedings via Skype. A week ago in suburban Detroit's largest congregation, the Reform Temple Israel in West Bloomfield (3,400 member units), Rabbi Harold Loss and his wife Susie were honored for their forty years of service to the congregation and to celebrate the rabbi's 65th birthday. Over 3,000 people joined together on the beautiful grounds of the temple, but the many who couldn't be there in person felt connected as well. The Friday night service was streamed live on the Web for the elderly and infirm who couldn't actually be there. The Temple Israel members who were on vacation that day also appreciated the live stream. Jim Grey reported that he and his family viewed the tribute service from their vacation home "Up North" and felt as if they were there without having to disrupt their family's retreat. Virtual technology is not only finding it's way into Jewish simchas. It is also being used to help Jewish educators extend their reach. Julie Wiener's Jewish Week article"For Hebrew Learning, The Skype’s The Limit" details how Internet tutoring is on the leading edge of use of technology beyond the classroom. Skype-based tutoring — piloted last year and formalized this year at [Temple] Micah [in Washington D.C.] — is not only a convenient, inexpensive way to give kids personal attention in Hebrew, but it frees up time at the once-a-week school for other lessons, explains Deborah Ayala Srabstein, the temple’s education director. Micah is one of a growing number of congregations using technology to address two of the most vexing challenges facing supplemental, or Hebrew schools: how to teach Hebrew effectively and how to best make use of increasingly limited classroom hours. Whereas a generation ago it was not uncommon for children to report to Hebrew school three afternoons a week, today’s programs —which tend to serve overscheduled families and compete with an array of other extracurricular activities — often meet as little as two hours per week. Virtual tools like Skype and live Web streaming are making the Jewish community feel smaller and allowing people to attend life-cycle events, from bar mitzvahs and weddings to funerals, that they otherwise wouldn't have been able to attend in earlier eras. These tools are also helping educate the Jewish future who are more overextended than any previous generation of young people.